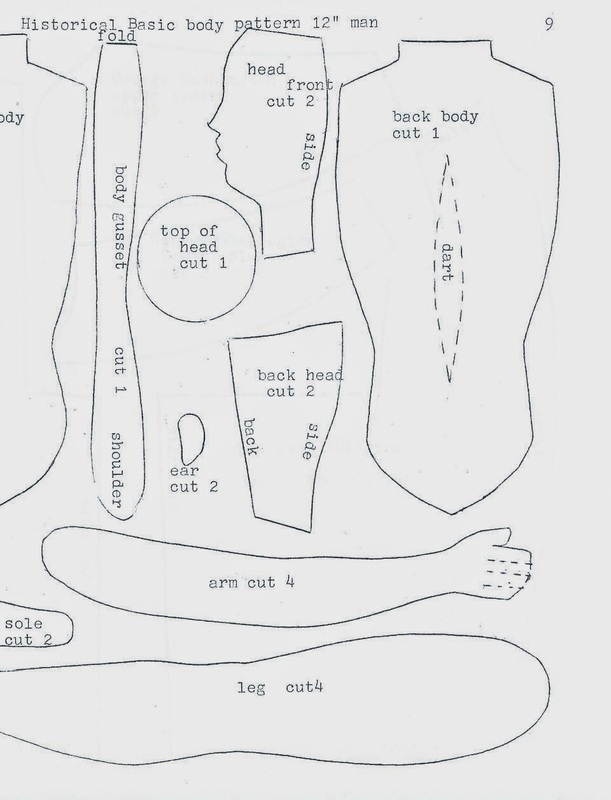 Ella DeHart self-published many doll patterns in the 1960s and '70s. 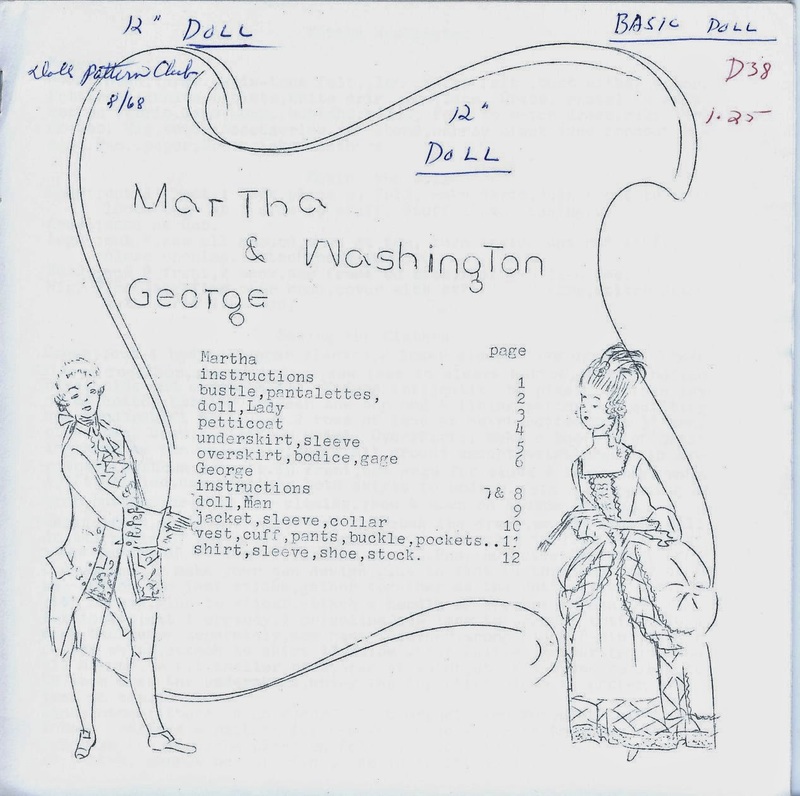 This pattern makes 12" George and Martha Washington dolls, with their complete outfits. 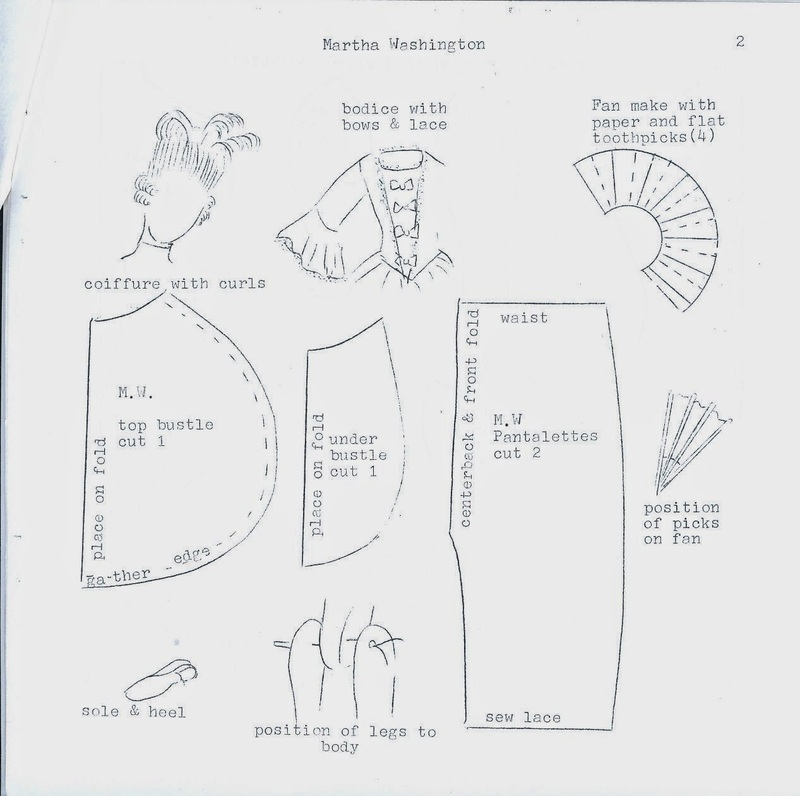 Martha Washington has a quarter-seamed head and torso, with separate bust pieces to be stitched on after her torso is stuffed. Her legs are shaped like heeled boots. She has mitten hands with stitching to indicate fingers. Her arms and legs are thread jointed. She has embroidered features and yarn hair. George has a somewhat different construction. His quarter-seamed head has a round pate piece and separate ears. His torso has a gusset that starts at one shoulder, goes down and around and up to the other shoulder. His arms and legs are thread jointed like Martha's. His hair may be a wig or yarn. The instructions call for both dolls to be made from felt. Their clothing is detailed and mostly appropriate to the late Colonial / early Federal era in which they lived. 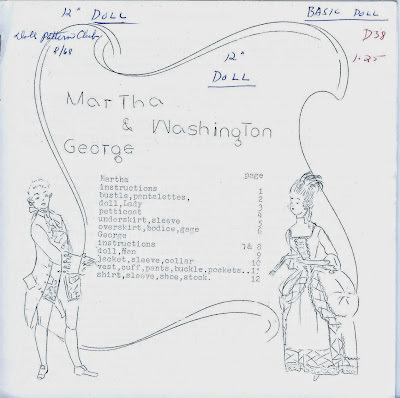 Martha wears a dress with quilted underskirt and two petticoats. She also wears pantalettes, which were not introduced until after her lifetime. The instructions call for a bustle to be worn under the overskirt, in the middle of her back; the cover illustration instead shows a bustle on each hip, which would give the impression of panniers (side hoops), more appropriate to Martha's time, or at least to the way she is usually remembered. Her shoes are to be made of felt and cardboard, and she carries a fan you can make from paper and toothpicks. George wears a shirt, stock (neckband) with lace jabot, knee breeches, hat, shoes and stockings. His suit and hat are to be made from felt. 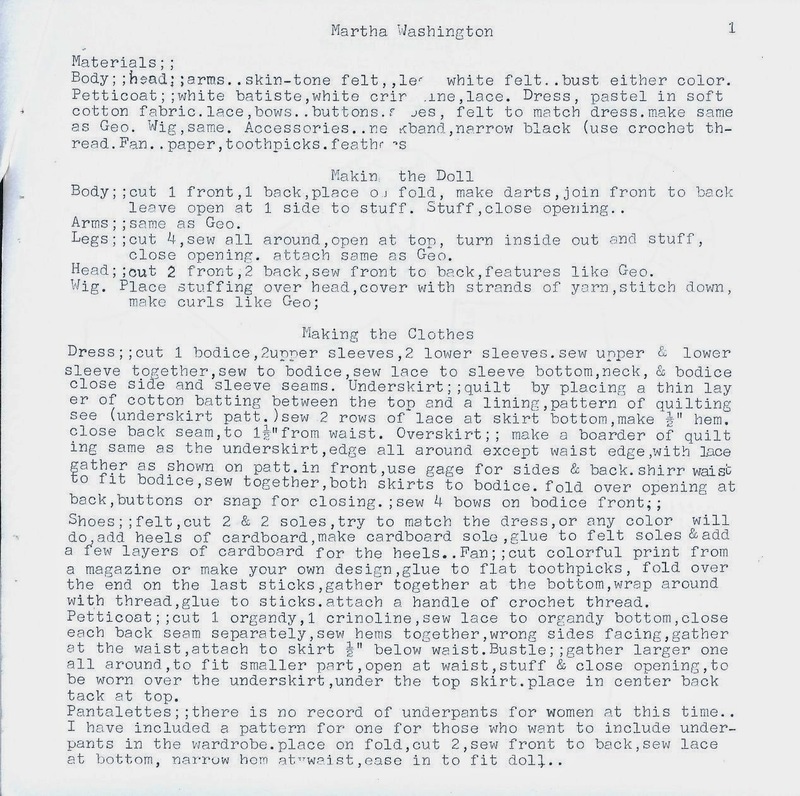 Personally I would skip the stockings and make his legs from white felt, as the maker is instructed to do for Martha. Ella DeHart patterns are very interesting but she was notorious for the lack of detail in her instructions. You really have to know what you are doing to make one of her patterns. This one would be a nice challenge for someone who likes to make historical character dolls.